Rural accommodation in the middle of nature. 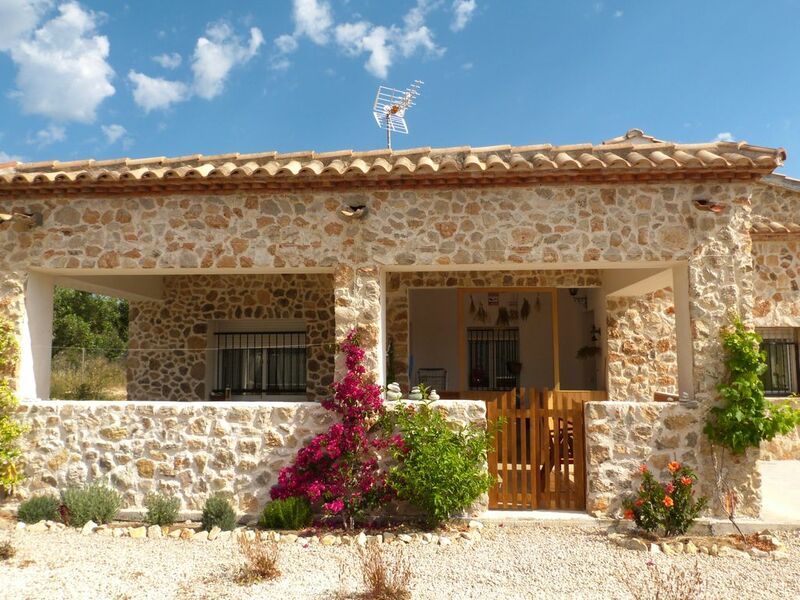 Stone house with 3 bedrooms, living room, kitchen and bathroom in a rural property surrounded by mountains. Very cozy and quiet. Recently renovated. 10 minutes by car from Guadalest and Benimantell and 20 minutes from Altea. Ideal for couples, friends or families who want to enjoy nature and mountain sports. Private parking area shared with the owner who lives in the apartment behind. Essential car, motorcycle or bike since it is not in the town. We have a bathtub for babies and urinals. I have a bathtub, a chair and a crib for babies. Also covered and special crockery for the kids. I live in the house below with my dog, although I am rarely, you have to take it into account. I have a baby bath, baby chair and baby bed available. Kids cutlery and plates. I usually live in the appartment below the house with a friendly dog, but im not often at home. J'ai unites lit baby, a petite baignoire et une chaise haute, plus special vaiselle in plastique pour les petits. Normalement j'habite dans l'appartement d'en bas avec mon chien, mais je suis pas toujours la. You were the best guests I've have, respectfull and always happy. It was a pleasure to share my house with you, I hope you come again soon, there are many climbs and hikes still waiting for you. what a fabulous place!!! clean and comfortable with mountain views all around. convenient to stores and the castle. We wish we'd had more time to spend there. Ines was so cool we invited her to come visit us in the states. She speaks English fluently. Her doggie was friendly and quiet. Our deposit was promptly returned. 2 things to note. Ines expects you to leave the house as clean as you found it. She lives downstairs with a private entrance and you can't even tell she's there. Ines is wonderful! Thank you! Thank you Rathna and family for your comment! you were excellent guests. I hope you find a nice place in the area, otherwise you are always welcome to my house. La maison correspond exactement à la description, Inès la copropriétaire vous réserve un très bon accueil et sait se rendre discrète, séjour très agréable, à 15 min des plages et proche départs randonnées et petit village plein d'histoire de Guadalest. Idéal pour famille de 4 personnes qui ne souhaitent pas être en appartement. Très agréable maison , au calme proche de la mer. A recommander. Merci beaucoup à Inès. Nuestra estancia en casa de Inés fue genial. Una casa limpia, tranquila y en la que poder estar con nuestro peludo. Agradecer a Inés por su atención y su amabilidad, muy buena anfitriona. En lugar es precioso para conectar con la naturaleza y perfecto para desconectar del día a día. Para repetir. Away from the village, in the heart of the mountains, with Aitana in the background, between Ponoig, Serrella and Bernia. Ideal for families or groups of friends who like mountain cycling. Guadalest is a picturesque village surrounded by mountains, with a wonderful municipal pool a 5 min drive. The nearest beaches are Altea and Benidorm, both 15 minutes away. The apartment is independent but on the farm I may live with my dog ​​(very affectionate) in the back. In that case the parking would be shared. I am not just at home and I respect the intimacy of the guests. Parking compartido con la propietaria que puede ser que habite detrás del apartamento con un perro muy simpático. No la veréis mucho. Shared car park with the landlord. The landlord may live behind the apartment with a friendly dog. Very respectful Parking partagé avec la propietaire. La propietaire peut être habiter derriére l'appartement avec son chien (trés amical), très respectueuse.